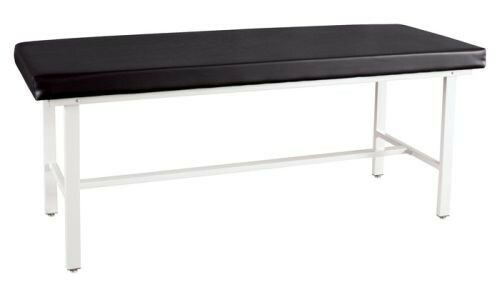 The Treatment Table, by Winco Manufacturing, is a flat level exam table that is commonly seen in doctor's exam rooms. This variety was specially made to provide comfort and aesthetic, but moreover to provide a function by bringing the patient to a height easy for the health professional to do his or her work. 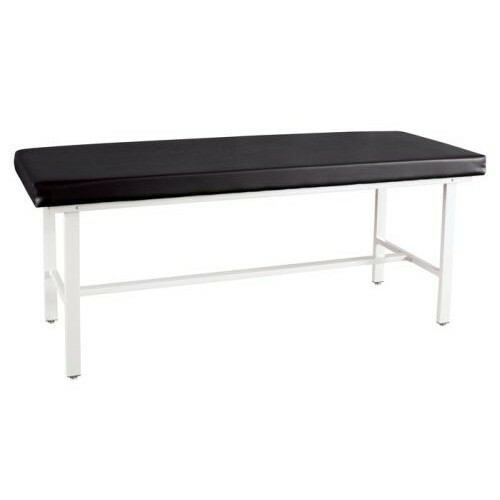 The qualities in these tables balance comfort and durability to make a long-lasting reliable table for health exams and general treatments. The Treatment Table has a broad platform to support most every sized person and weight. The thick pad is made of medium density foam and has a thick vinyl cover for protection and color. The vinyl cover is offered in a number of color choices. See the adjusting table color selection sheet and send to Vitality Medical. The table frame is extremely durable and strong as it is constructed of high grade steel. The four legs are supported by a cross beam, while a center beam supports the leg pairs. For the SH model, there is instead a metal platform that connects to the leg pairs and rests over the cross beams for support and for storing items. For the C1 model, there is an open shelf and a two cabinets, while the D1 model has handled drawers instead of cabinets (see alternate photos) and an open shelf. The metal has a white powder coat paint. There are a variety of add-on's for the table available to order, including custom-ordered leg heights (19, 25, and 36 inch legs) as well as opting for double cabinets or double drawers. The cabinets and drawers can also be fully laminated as an option. For these option prices or to order, simply call Vitality Medical directly. Allow a 48 hour turnaround time to fulfill the shipments as requested by the manufacturer. The table is great for exam rooms and gives a perfect height elevation for doctors or caregivers to interface with the patient. There are variety of options for storage and height that can be special ordered. The padding is two inches thick, made of medium density foam.